Payload specialist training had commenced in September 1976. Henize joined the programme in time to become involved in the mid-phase review and revision of flight plans, and in the early definitions of the crew activity plan. He was also able to participate in meetings of the Investigators Working Group (IWG) and the Mission Steering Group (MSG). In February 1977, he participated in the first of two four-day simulations at the SPICE facility in Porz-Wahn, Germany, taking the role of MS.
• Chief coordinator of in-flight activities, where it is useful to have one person monitoring timelines and issuing warnings of expected task changes while the PS focuses on the matter in hand. • Chief coordinator of in-flight communications, filtering ground communications away from "a strong tendency to bug the PS with useless questions." On orbit, an MS would screen the questions to allow the PS to continue with critical tasks. • Representative of the payload crew at high-level meetings, where the payload specialists are neither experienced in anticipating how management decisions may affect them, nor particularly bold in defending themselves. Henize frequently informed the management about what they could and could not expect the crew to do and defended them from well-intentioned but ill-conceived planning for sleeping, eating and briefing periods, and in how POCC policies could affect the crew. Being involved with the IWG and the MSG - though without official sanction - Henize was "initially tolerated as a guest" and it became evident to him that crew input in these meetings would be very useful. • Back-up operator of several, if not all the experiments, prepared to step in and take over the operation of the remaining experiments if a problem occurred that required the intervention of the PS to resolve. • Primary operation of a few, but not too many, experiments. Henize made it clear that the MS could and should share the load in operating experiments that did not fit the expertise of any individual PS. However, such a load should not occupy more than fifty per cent of their work time, leaving the remainder free for their coordination or planning roles. Henize recognised that the above roles were clearly valid for ASSESS, in which up to four payload specialists were working simultaneously and the pilots were fully occupied with flying the plane. But he also suggested that some of these roles could be shared with the Shuttle commander or pilot on a real mission, and that some might not be required at all. Henize's work with the Europeans in defining roles on ASSESS-II was also becoming valid for future Shuttle missions with Spacelab/science payloads. 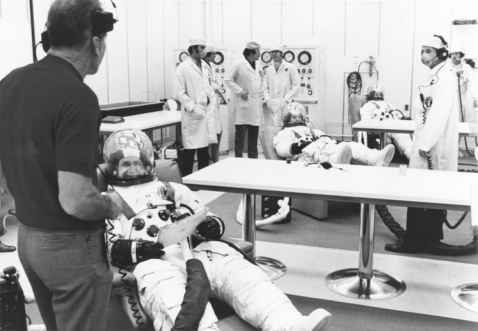 Henize also supported the need for longer simulations, a recommendation made by Musgrave after completing the first Spacelab Medical Simulations at JSC (see below) and for CB involvement with the screening of payload specialists as soon as possible in future assignments. The subject of the overall relationship between MS and PS was very sensitive at the time in the US, but early involvement would help blend the PS into the Astronaut Office training philosophy more smoothly. Indeed, MS cross-training would be an advantage in supporting and understanding the requirements of the PS on each flight. One unresolved issue at the time of Henize's memo was how to back-up a PS: "If the candidates are PS-type scientists and engineers, they have little to gain and much to lose (with time out from their professional activities) by playing the back-up role. It might be expected that they may not wish to. Who, then, should play the back-up role? No one? The mission specialist? Some other scientist-astronaut? Some other NASA person from the payload centre?'' Henize realised this was a thorny issue, and one that would continue to be debated within the FOD for some years to come. In the event, this did not mature as suggested. All NASA back-up roles were suspended from STS-4 in 1982, when NASA felt it had a sufficient pool of experienced astronauts available to replace any flight crew member should the need arise. Back-up crew assignments in the NASA astronaut corps did not become the norm again until mid-1994 and the Shuttle-Mir programme of long duration residence on the Russian space station, when the Russians required such an assignment in their crewing policy for resident crew members.